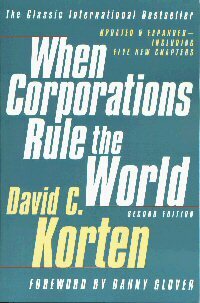 The Book: When Corporations Rule the World, (1995, 2001, 2015). The New Story: The consolidation of global corporate power through a systematic deregulation of markets and elimination of national borders to facilitate the unrestricted global flow of money and goods prevents nations and local communities from managing their economic resources in their own interest. And it gives global corporations and financial markets free reign to exploit people and nature. The human future depends on limiting corporate power relative to people and community power and restoring fair market rules and borders to encourage ecologically-balanced local self-reliance. In 1992, the Forum’s headquarters moved from Manila to New York City and we began to look up stream for the source of the dysfunctions of the aid system. We saw powerful global corporations using their political power to eliminate rules that constrained the extension of their control over the world’s resources, markets, and governments. In 1994 the Forum participated in the formation of the International Forum on Globalization (IFG), which became an influential international alliance of individuals at the forefront of changing the story on corporate globalization. 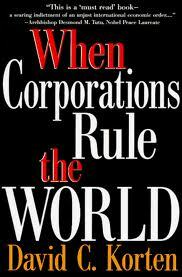 When Corporations Rule the World (1995, 2001, 2015) launched in October 1995, a month before the historic IFG teach-in on economic globalization at New York’s Riverside Church.It proved to be the right book at the precise right time. David Korten was invited to keynote national conferences and became a regular guest on radio and TV talk shows. The book became an international best seller with sales of 150,000 copies worldwide in three editions and some 18 languages and became known as the bible of the 1999 Seattle WTO protest that shook the world and brought global civil society and the popular resistance against corporate globalization to the fore of public attention. When Corporations Rule the World, named a problem that people were beginning to sense, but could not quite articulate and provided a frame that tied together the strands of data and experience people were seeking to comprehend. Furthermore, it explained the increasing economic stress many people were feeling in the midst of what were being touted as economic boom times. It made clear that the stress was the consequence of human decisions that shifted power from people and democratic institutions to global corporations that operated largely beyond democratic accountability. We argued the case that decisions made by people can be changed by people and that as citizens we have the right and ability to do so.